Glaro Inc., a leading national manufacturer of fire resistant receptacles shares three compelling reasons why all metal fire resistant receptacles are essential for public buildings and an important part of a facility’s safety plan. Glaro Inc., a leading national manufacturer of metal waste receptacles, recycling receptacles, smoking receptacles and a number of additional product lines, shares three compelling reasons why all metal fire resistant receptacles are essential for public buildings and an important part of a facility’s safety plan. First, Glaro Inc. points out that metal waste receptacles do not melt or burn. In addition, whereas an all metal construction does not emit harmful gases into the environment, plastic receptacles exposed to fire tend to melt and release toxic fumes into our surroundings. By contrast, Glaro executives say that heavy duty metal receptacles tend to be safer because they help contain fires by restricting the flow of oxygen critical to a fire’s ability to spread. Glaro Inc. claims that using fire safe receptacles is an excellent way for building managers and owners to demonstrate to their paying customers, occupants, visitors and even fire inspectors, that safety comes first. According to Bob Betensky, “a deadly fire in a building can be catastrophic to a community and its families. Taking preventative measures shows that you care and that you are actively decreasing risk, minimizing liabilities and keeping people out of harm’s way.” Members of the Glaro Inc. executive staff explain that while laws are in place in most States, many people smoke where they are not permitted to outdoors or indoors. “Cigarettes are not always snuffed properly or disposed off in the right receptacle. That can lead to sparks and fires,” says Plant Manager Bob Glass. Facility managers who care about public safety can mitigate this risk by using fire safe waste receptacles in combination with sprinklers, regular inspections etc. and other fire safety measures, to make sure that their buildings and the people in them stay safe. If you are looking for fire safe receptacles, contact Glaro at 1-888-234-1050 to find out more information. 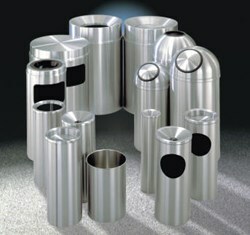 Glaro also has a full line of smoking receptacles and other waste receptacles that help contain fires. Additional information is available on the Glaro blog located at glaro(dot)biz and its website glaro(dot)com.